In this passage James compares two kinds of wisdom: false wisdom & true wisdom. In this world, there are many different ideas about how we should live. James tells us there is a right way to live and a wrong way. What’s the difference? Why is it important? How do we know if we are living a life of true wisdom? To prepare, read James 3:13-18 and also Proverbs 2:1-11 and Proverbs 8:22-36. I also want to thanks Troy Smith for preaching the last two weeks while we were away on our family vacation. My prayer is that we all continue to ask God to reveal himself to us more and more as we study the Book of James together. This week, we will continue our study of the Book of James by focusing on James 2:1-13. To prepare, read James 2:1-13. You can also read 1 Samuel 16:1-13 and 1 Corinthians 1:26-31. How do these other passages relate to what James is saying? 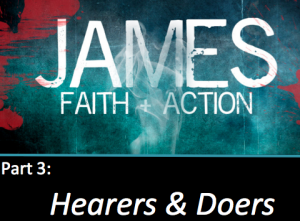 In this message we learn about how to be doers of the word and not just hearers.